For the longest time I lived a car-free lifestyle. Okay, I’m going to be honest and say that I had an ECO pass from my job and I was afraid to learn how to drive. Ahem. I’ve since learned how to drive and own a car but still love exploring Denver via all of the awesome ways there are to get around town-car free! Don’t have a car? No worries here are 10 ways to get around Denver without one. No Worries! When I was younger having no car would have been a huge problem. Fortunately, Denver has caught up with the times and there are a ton of ways to get around. RTD (Public Bus)-I have a very long relationship with the bus system. I learned how to drive as an adult which means I took the bus for a ridiculously long time LOL! I’ve also traveled quite a bit around the US and the world and I feel that Denver has a pretty decent public transit system. While there are a couple of buses that I try to avoid like the: 15 and the 0 after rush hour, in general the buses that people will take in the Central Business District are well-maintained and easy the bus system is pretty easy to understand. The main transit hub in Denver is located at Union Station and you will find the bus terminal underneath the train station. Bike-I love riding my bike around town. I have a Public Bike C7 that I purchased recently. It’s kind of a cruiser/street bike hybrid that you may see a lot on the streets of Denver. It’s super cute and light enough for riding longer stretches like the Denver/Boulder bike US 36 Bike path. Our Bike Sale is On. Shop PUBLIC Bikes Today! Stylish commuter bikes on sale now. No Offer Code Necessary. SHOP NOW or forever wish you had. Denver Bcycle-I love this bike sharing program. If you’re on vacation and visiting Denver/Boulder the B-Cycle program is a great way to rent a bike and explore the town. Bike share stations are located throughout the city and they are adding stations all the time. Click on the following link to get information on the daily, weekly, or monthly rates. Hopefully, we will see you at the next Cruiser Ride that happens once a month from mid-May-September. Scooter-I haven’t had a chance to check out a scooter tour but it’s on my list. Whenever I think of scooters I think of my time in Europe. There are scooter tours offered in town and if you’re moving here, there a number of shops that you could purchase your next scooter from. Share your experience with us. On foot-I love walking around town and exploring the many different areas on foot. Check out Eat.Walk.Learn if you would like a guided tour throughout the different neighborhoods in the city of Denver. 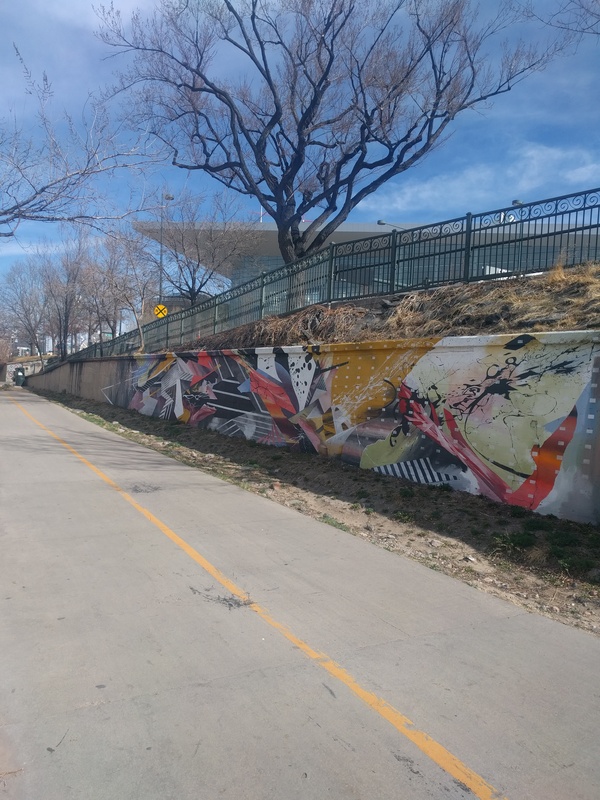 My favorite area to explore is the RINO area because of the sheer number of murals in that neighborhood. I also love exploring the city and looking for Little Free Libraries because I’m weirdly obsessed with them. I love to read! And, free books rock. Denver has so many Little Free Libraries that it was recognized as a city of distinction. So awesome. LYFT-I am a huge fan of LYFT and I prefer to support LYFT because so many people are getting UBER that LYFTS are always available. I’ve had a great experience being picked up pretty quickly and getting to where I would like to go in a reasonable amount of time. Never used LYFT? Get $5 towards your next ride as a new user. Click here! Rickshaws/PediCabs-You know, those 3 wheeled contraptions with a ridiculously fit person propelling them with leg power? These are located throughout downtown Denver and are a lot of fun to use. The cost is around $2 a block plus tip your driver. You will find these outside of Pepsi Center, along the 16th Street Mall, Union Station, and other well-known points of interest. LightRail-I love Denver’s light rail. To my big city peeps-no, it’s not like NYC’s Metro or Chicago’s L, but it’s a wonderful addition to Denver’s public transit scene. The light rail is clean, has pretty decent security, and affordable. You can get around Denver/Aurora/Arvada (soon) and it’s slated to expanded to other areas of the city in the next 5 years. It costs $5.25 for a day pass and I strongly recommend getting a day pass because it just makes life easier. We also have the Train to the Plane that takes travelers to Denver International Airport. The cost for that is $9. eTuks-There is a wonderful Denver-based company making electric rickshaws. Fortunately, there is a TON of business shuttling Denver people from one fun event to another so they are coexisting nicely with the pedicabs. I’ve included a link to eTuk’s Facebook page so that you can research how to rent them for your next event (or, where to find them-usually in RINO). Segway Tours-Ok, don’t laugh, but Segways freak me out. That said, for those of you who aren’t freaked out by them, Segway tours are offered in Denver. You will have to research this one on your own LOL! Whenever your exploring the town using these alternative forms of transportation always remember safety first. Wear a helmet, don’t act crazy, and don’t drink and ride. Looking for Jobs in Denver, Colorado? Use this Guide!